Home » Berthon Blog » Dixon 63 DULCINEA – rat race escape capsule – par excellence…. Dixon 63 DULCINEA – rat race escape capsule – par excellence…. 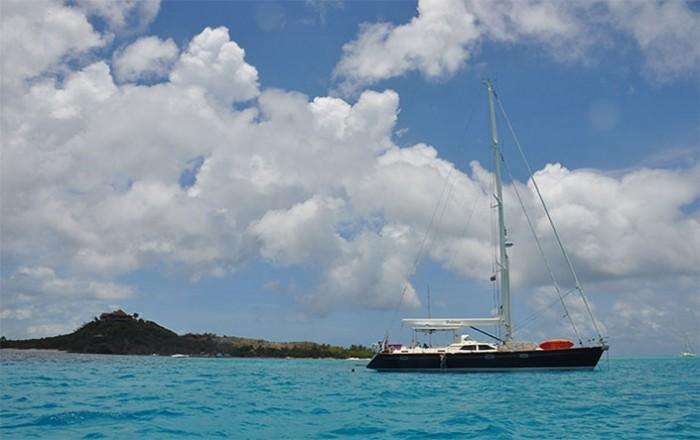 DULCINEA was designed for her first owner by Bill Dixon when he went to the market and couldn’t find exactly the right yacht. He was looking for a yacht that could be handled 2-handed by himself and his wife and which would be comfortable for 4 guests. He also wanted the option of crew accommodation if he and his wife did not want to do all the work (sometimes with guests onboard and a strenuous programme it can feel as if you’re running an upmarket B&B, acting as tour guide, chef & bottle washer and of course you are also the entertainment!). Once he had his design, he went to Vaudrey Miller in New Zealand and they built her in cedar core with e-glass and delivered a yacht that was exactly to his design and taste and which was also MCA Category 2 against the day when he might want to charter her. Once commissioned in 2002, and in the Mediterranean, his adventure started. She spent seasons in the Caribbean and the Mediterranean and always was professionally maintained, she clocked up an impressive amount of miles as well, with ear to ear smile sailing for whoever was lucky enough to be invited. She also had a charter programme which was successful and for which she was perfectly suited. Her cockpit looks modern today with its twin wheels and easy access to the main cockpit and companionway. It is perfect for sailors and non-sailors alike, to enjoy the sailing but also great with gin and tonic at anchor. Her hydraulic opening transom makes access on and off the yacht easy and her dinghy is easily deployed with davits which disappear into the deck when not in use. DULCINEA has in-boom furling and electric furling at the front which is simple to use, looks the business, and is easy to handle under all points of sail. Down below the main saloon is light, airy and enormous. Her guest accommodation forward gives flexibility with the option of double berths and singles. The crew accommodation forward is functional. Back aft, owners’ quarters are large for a 63 footer with storage in abundance. She has great engine access and is easily maintained – always important when the magic carpet has far to go…. After many happy years we found her second owners, a charming family of 4 from Down Under who were looking for a cruising home for a 3 year sabbatical. After some serious searching, DULCINEA was chosen. The adventure is now drawing to a close – there is a desk to be driven, school run to be managed and exams to be taken. This summer DULCINEA will take them from Palma to Sicily, Greece and Turkey, before returning to Palma to lie for sale at the end of the season. DULCINEA is for sale now and can be viewed during her summer programme should you wish.